The stars of US sitcom The Golden Girls have paid tribute to actress Estelle Getty, who has died at the age of 84. Bea Arthur, who played her on-screen daughter Dorothy Zbornak, called their partnership "one of the greatest comic duos", adding: "I will miss her." Rue McClanahan, Blanche in the series, said: "She'll always be with us in her crowning achievement, Sophia Petrillo." Getty, whose role as the sarcastic pensioner won her an Emmy award, had been suffering from advanced dementia. Her son, Carl Gettleman, said she was "one of the most talented comedic actresses who ever lived". Apart from the Golden Girls, Getty's credits included films like Mannequin and Stop! Or My Mom Will Shoot. According to her official website, the actress was born Estelle Scher in the Lower East Side of New York City after her parents emigrated to the US from Poland. But the actress faced a long struggle for success, working in poorly-paid office jobs to help support her family while she tried to make her big break. "I knew I could be seduced by success in another field, so I'd say, 'don't promote me, please,"' she later recalled. After trying her hand at stand-up comedy - later calling it "her biggest mistake" - she began to land a smattering of films and TV roles, including parts in Tootsie and Deadly Force. But it was The Golden Girls which made her a household name and saw her nominated for an Emmy seven times. The sitcom, which focused on the lives of four older women living in a shared home in Miami, Florida, was developed by US TV network NBC after its programming chief Brandon Tartikoff decided that older viewers were being ignored. 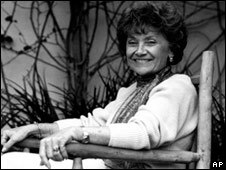 Getty was the last actress to be cast for the series - having failed two auditions because producers thought she did not look old enough to play an 80-year-old. But the wisecracking Sophia Petrillo proved so popular that she was brought back for two spin-off shows - Empty Nest and The Golden Palace - in the 1990s. Audiences particularly loved the verbal zingers Getty would hurl at her co-stars. When Rue McClanahan's libidinous character Blanche once complained that her life was an open book, Sophia shot back: "Your life's an open blouse." Nonetheless, Getty said she was only "a teensy-weensy bit" like her most famous creation. "I think people have me mixed up with my character," she said, while admitting: "I would like to be as sure and magnanimous and feisty and strong and indomitable as she is." She married Arthur Gettleman at the age of 23, from whom she adapted her stage name. After The Golden Girls, Getty secured several memorable film roles - in particular her grotesque comic turn as Sylvester Stallone's mother in Stop! Or My Mom Will Shoot - and launched a successful exercise video for older women. 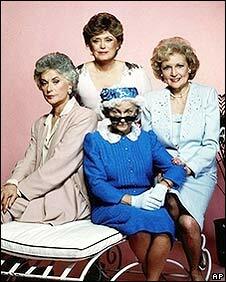 But she was unable to join a Golden Girls reunion in 2004 due to her failing health. The star's husband passed away that same year. Getty died at her home three days short of her 85th birthday and is survived by her two sons, Carl and Barry. "She was loved throughout the world in six continents," said Carl in a statement, "and if they loved sitcoms in Antarctica she would have been loved on seven continents."